from FRONTLINE's interviews with Jim McBain and Brad Andrews, Sea World, Inc.
Marine biologist Kelly Waples' fascinating, first-hand acount of lessons learned from a project in the early '90s to reintroduce to the wild nine bottlenose dolphins from a Western Australia marine park. 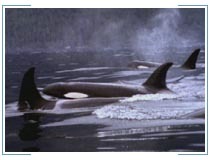 In this investigative piece, orca expert Erich Hoyt reports on numerous accidents, and even deaths, involving trainers of killer whales. In 1992, Congress allocated $500,000 to the Navy to explore the possibility of returning to the wild dolphins deemed unnecessary to military programs. In October 1993, the Navy issued this report which concluded that, because of the research and technological development required before the dolphins could be returned to the wild safely, a reintroduction program would not be cost effective.